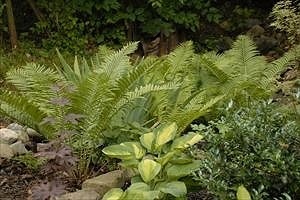 Planting ferns in a garden is like frosting on a cake – delectable, often frothy and capable of transforming the ordinary into the extraordinary. The delicate, fragile-looking fronds (leaves) of these plants may lead you to believe they are hard to grow, but they’re actually quite easy to get established. If you give them the conditions they need – partial to full shade in moderately fertile soil with good drainage and adequate moisture – these woodland perennials will stay healthy and vigorous for many years. These plants produce foliage, stems and roots, but no flowers or seeds. The stems are not obvious as they are rhizomes that grow beneath or along the soil. Reproduction occurs by stem expansion, by underground runners or from spores – fine dust-like particles that reproduce the parent plant after many months if growth conditions are ideal. Spore cases (sori) are visible on the underside of mature fern fronds as regular patterns of brown dots. The only maintenance needed is in the spring, when you remove the old foliage by raking, or cutting off dead fronds. You should do this in the early spring before the new, delicate coiled fronds, called fiddleheads, begin to unfurl. Grown in a woodsy soil enriched with compost and leaf mold, they never need added fertilizer. Native types are common everywhere, but be careful: some make good garden plants, while others spread too rapidly to act as well-behaved companions to shade perennials, such as hosta, foamflowers, Solomon’s seal and brunnera. However, there are many fine species and cultivars that have proven their garden worth with luxuriant, elegant, lustrous and distinctive foliage. Autumn Fern (Dryopteris erythrosorba): The cultivar ‘Brilliance’ is brighter red with longer lasting color that reappears in the fall. It is surprisingly drought tolerant when established, but needs consistent moisture to get established. Rabbit and deer-resistant. 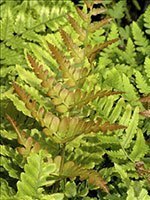 Lady Fern (Athyrium filix-femina): This graceful deciduous North American native has a delicate texture and is also easy to grow. It thrives in moist conditions with rich loamy soil and morning sun. The plant has an upright habit, growing 2-3 ft. tall. Hardy in zones 3-8. Rabbit resistant. Japanese painted fern (Athyrium niponicum ‘Pictum’): Very showy with fronds that are soft shade of metallic silver-gray with hints of red and blue. Hardy in zones 3 to 8; grows about 18 inches tall and makes a clump more than two feet wide. Was named 2004 Perennial Plant of the Year. For more information and a picture, click here. 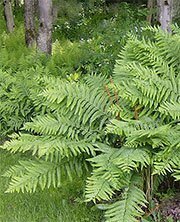 Cinnamon Fern (Osmunda cinnamomea): A large plant (3-5 ft. tall and 3 ft. wide) that requires shade, moisture and humus- rich soil to flourish. Hardy in zones 3-7. The base of each frond has scattered tufts of cinnamon-colored fibers. The fronds die down for the winter after turning shades of gold and bronze in the fall. Deer-resistant. 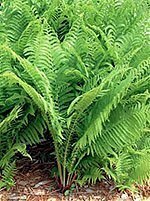 Christmas Fern (Polystichum acrostichoides): Very easy to grow, it has classic ferny foliage and is evergreen in winter, hence the common name. Adaptable, can take very dry to moist soils. Hardy in zones 3-8. Grows 12-18 inches tall and 18 inches wide. Northern Maidenhair Fern (Adiantum pedatum): The 12-20 in. tall fronds of this exquisite plant are palmately divided into green “fingers" held on stems that resemble shiny black wire. It grows in zones 3-8 but is most vigorous in the northern zones. If you can give it a moist site with bright northern light, it will easily spread into a colony resembling a delicate green cascade. Ostrich Fern (Matteuccia struthiopteris): An elegant, tall plant with bright green deciduous fronds that can grow 4-6 ft. tall. Very hardy, from zones 2-7. Forms thick, tropical-looking colonies and spreads by vigorous underground runners, making it ideal for naturalizing in partial shade. However, this plant is quite a spreader and can overrun a bed, so be careful where you use it. This is one of the few types that will grow well in full sun as long as there is ample moisture.